So to start let’s be clear this not Facebook stories. 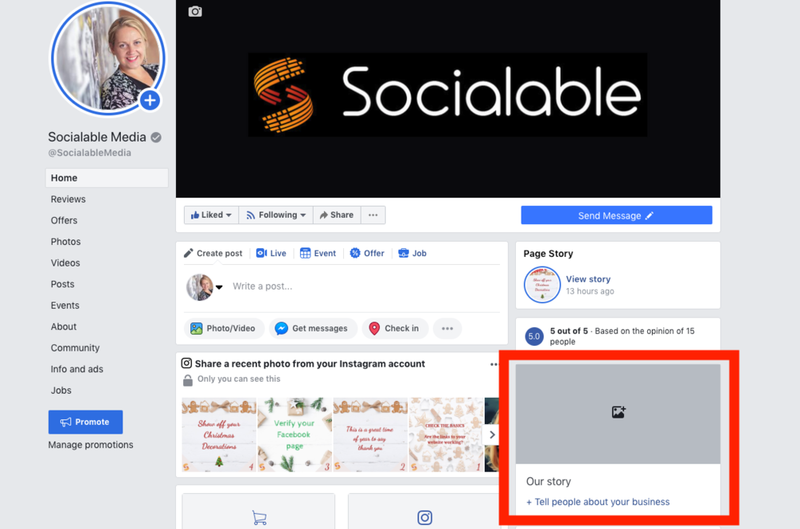 Facebook ‘Your Story’ is the section on your Facebook business page that appears on the right of the page, when viewing on desktop. When viewing your Facebook page on mobile this section will appear before your posts. This is prime space which means it’s important you use it and use it wisely. You have space for an image, title and a description. Think carefully about what you want to tell visitors to your page. It’s worth considering that only the first 100 characters of the ‘Write something…’ will display on your page - although visitors are able to click for more information. I’ve noticed that image will left-justify so you might want an image that doesn't required being centred to make it look great. This is how the finished ‘Your Story’ will be displayed to visitors to your Facebook page. If you already have a Facebook Your Story now is a great time to check it’s still relevant, does it need an update or refreshed image? Let me know how you get on updating Your Story on Facebook.